Self-confidence may be an issue for either you or members of your team from time to time. This is only natural. Such temporary losses of self-confidence are probably the result their reactions to events in the earliest years of their lives. They may not even be able to clearly recall what happened. All they know is that in certain circumstances their self-confidence levels decline. What is happening is that certain circumstances trigger memories which dredge up feelings from the past. When they get those feelings their confidence declines. The problem is that when confidence declines it tends to have an adverse effect on performance. In order for declines in self-confidence not to become issues for your team it is important that every member of the team learns to quickly manage the threat of impending loss of confidence. It is the responsibility of each team member to learn to manage their own feelings. 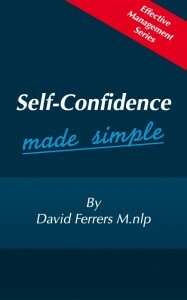 Techniques for managing declines in self-confidence are outlined in my new handbook Self-Confidence Made Simple. These techniques have been tested and found to work by many people over a number of years. When used properly they will help anyone who has an issue with self-confidence.